The "little gentleman in velvet" is a voracious eater and catches worms with a rapidity which is astonishing. They devour their own weight of worms in a short time - needing 50% of their bodyweight in food per day. They can quickly die of starvation. When eating a worm, they hold it in their front paws like a squirrel, or hold it down with one foot - carefully wiping each worm clean with their claws. Worms are the main diet, but they eat any insect as well as slugs, snails, larvae or whatever appropriate meal crosses their path - the leather-jacket larvae of daddy-long-legs, mice, shrews, small reptiles, dead frogs, mice and birds. In deciduous woods on clay soil there will be more than sufficient worms to feed the average population of about two moles per acre and the mole will not often have to venture above ground away from his long underground tunnels. Earthworms fall into mole tunnels during their travels. Trapped, the worms start to escape through the harder soil of the floor of the tunnel. 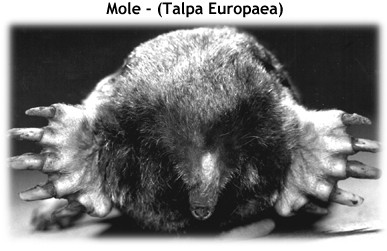 However, the mole usually senses them and eats or traps them before they make a get-away. Worms not needed immediately are kept injured but alive in a larder at the side of an underground run. They will remain there until eaten or until they grow more segments and escape. Moles also find worms during the construction of the tunnels. Since moles are almost entirely subterranean, above-ground food sources do not often attract them. They do, however, come up to the tunnel entrance to find nesting materials, and sometimes eats slugs and surface earthworms there. Diets change seasonally with an increase in the consumption of insect larvae during the summer months, when the diet consists of almost 40% larvae compared with a mere 15% during the spring, autumn and winter months. Moles are useful in that they eat insect larvae, such as cockchafer grubs which damage grass and root crops and their tunnelling brings fresh soil to the surface, helping to aerate the land. The female builds her own safe nest in a football-sized chamber lined with dead leaves and grass. A larger molehill may cover the breeding nest in spring. the hairless young are born in June, generally four or five of them. The curious mounds of earth thrown up by moles - mole-hills - would not be such a bane to gardeners if they realised the excellent drainage and soil aeration these tunnels provide free. However, moles seldom nest in water-logged soils. Elaborate tunnel systems are not just homes, they are carefully constructed traps to catch their prey, as well as their kitchen and dining room. Moles often return to the same sites annually. Enlarged nest chambers are built in the centre of tunnel networks, in which they weave a ball of dried grass. Elaborate "fortresses" are built above the surface if the soil is not deep enough for a conventional nest. When they are underground moles are relatively safe from predators, but above ground they are killed by cats, birds of prey and man. Weasels enter the moles' run and kill them underground. The young are particularly vulnerable in early summer when they leave the burrow to search for territories of their own. Buzzards and ravens will take them as will herons who sometimes stab moles with their beaks when they detect movement just below the surface. Tawny owls catch them at night. Man, though, has always been the mole's greatest enemy. Once killed for either fashionable moleskin coats or for plumbers who found moleskins excellent for wiping joints in pipes, now many are poisoned by farmers. The farmer's main objections to them are that they disturb seedlings of wheat and throw up stones on their molehills that blunt the cutting-edges of farm implements. Their burrow systems, two-inch wide tunnels, often extending for about 200 metres (about 200 yards) are more often found in deciduous woodland, grassland and pasture and less frequently in coniferous woods which are not rich in soil fauna. Moles build a series of complex tunnel systems in any part of Britain with a soil deep and rich enough to support the type of soil invertebrates on which they feed. They tend to prefer drier areas, and are rarely found in heavy, damp soil. Once a permanant tunnel system is constructed the mole circulates around it, waiting for its prey to fall into it. It does not excavate all the time - molehills on the surface only offer clues to a burrow. Tunnels may be used for one lifetime or for several generations. They often interconnect, even though moles are solitary creatures. Moles are found throughout mainland Britain and on a number of the offshore islands, such as Wight, Anglesey, Skye and Mull. They are, however, absent from Ireland, many of the Scottish islands, the Isle of Man and any area above 1,000 metres (about 3,000 feet).